BACHELOR DUKE (USA) (Bay 2001-Stud 2005). Winner at 1m, Irish Two Thousand Guineas, Gr.1. Sire of 495 rnrs, 274 wnrs, 14 SW, inc. Shuka (WRC Captain Cook S., Gr.1), Dukedom, Scapolo, Single Minded, Keyora, Obsession, Spring Cheer, Luminous Eyes, Whispering Gallery, Bachelor Son, Multivictory, Devonshire, Crystal Duke, Single Currency, SP Flaming, Rich'n Unhitched, Sweet Suitor, Prince of Wales, Fortun, Sultan of Swing, Devour, Lear Oile Oile, etc. CRYSTAL DUKE (g. by Bachelor Duke). 10 wins-1 at 2-from 1200m to 2000m, NZ$145,050, CJC Spring Classic, L, Winter Classic H., Rex Johnston Memorial H., Plough Hotel H., Brisbane Racing Carnival H., 2d CJC Speight's Westenra H., Christchurch Casino H., Riccartonpark.co.nz H., 3d CJC Christchurch Casino Winter Classic, Farmers Mill H., Racecourse Hotel Motor Lodge H., Newstalk ZB 3YO H.
Inastride (g. by Sakhee's Secret). 3 wins at 2100m, 2200m to 2017-18, BOP RC Platinum Homes Tauranga H., 2d Waikato RC Lodge Real Estate H., 3d ARC New Zealand Herald Super Sport H.
Right at the Pin (g. by Pins). 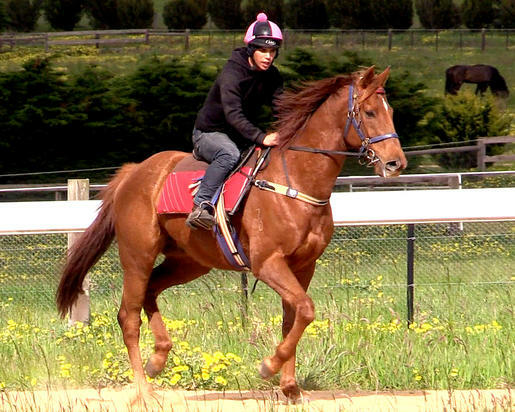 2 wins at 1200m, 1400m, 3d CJC Teakaustud.co.nz H., NZI H.
Duke of Oz (g. by Bachelor Duke). 2 wins. See below. Starvoia (Starcraft). 3 wins at 1000m, 1200m, NZ$80,700, in 2016-17, CJC Echoes of Heaven at Linwood Park H., Gavelhouse.com S., Otago RC Speight's H., 2d Southland Guineas, L, CJC Canterbury Belle S., L, Otago RC Dunedin Guineas, L, New Zealand Bloodstock Insurance Breeders' S., L, 3d Gore Guineas, L.
FATAL (Bakharoff). 9 wins from 1350m to 2150m, NZ$192,625, A$5,200, BOP RC Japan-New Zealand International Trophy, Gr.2, Bay of Plenty Cup, Hawkes Bay Windsor Park Stud H., Best Travel H., Manawatu RC Air New Zealand Link H., WRC Douro Cup, 2d ARC Easter H., Gr.1, WRC Montana Wines Mile H., 3d WRC Thorndon Mile, Gr.1, Waikato RC International S., Gr.1, ARC Korean Racing Association Recripocal Trophy Race, Manawatu RC Fisher & Paykel H., 4th AJC Colin Stephen H., Gr.3, Manawatu RC DB Draught 1600 H., L.
RICHFIELD DESTINY (Bakharoff). 7 wins from 1800m to 2200m, Waikouaiti Cup, L, ARC Ellerslie Intermediate Stayers Championship Final, Avondale JC Ross Haldane H., 2d Canterbury Breeders' S.H., L, 3d CJC Colville Signs H. Producer. Silent Sophia (Fuji Kiseki). 7 wins from 1200m to 1600m, A$165,680, SAJC Davison Earthmovers H., Distinctive Homes H., BGC Industrial Cleaning Supplies H., Projection Graphics H., Jordan Plumbing H., 2d Balaklava Cup, L, MRC Snitzel at Arrowfield Stud H., SAJC Sealink Travel Group H., Tooheys New H., Consolidated Plant & Quarries H., AV Jennings H., MVRC Pulse Pharmacy H., SAJC Distinctive Homes H., Flight Centre H., 3d SAJC Reaan at Lindsay Park H., Betfair.com H.
CARNEGIE EXPRESS (Carnegie). Second on the 2001-02 Australasian 3YO Classifications (intermediate & long). 6 wins from 1400m to 2000m, A$1,132,385, STC Rosehill Guineas, Gr.1, Canterbury Guineas, Gr.1, Gosford Guineas, L, STC Do It at Diggers' H., Silver Saddle Brasserie H., 2d Australian Derby, Gr.1, 3d STC Hill S., Gr.2, 4th STC Ranvet Rawson S., Gr.1, AJC Craven P., Gr.3. TRIS (Street Boss). 3 wins-2 at 2-at 1100m, 1200m, A$137,630, to 2016-17, SAJC Breeders' S., Gr.3, 2d MRC Grand Hotel Frankston H.
Pennywest (Dexter). 6 wins from 1200m to 1800m, A$170,265, WATC Gary Carvolth H., 2d Western Australian Oaks, Gr.2, WATC Natasha Trophy, L, Sheila Gwynne S., L. Producer. Northern Hero (Jetball). 9 wins from 1400m to 1800m in Macau, Macau Assert H., 2d Macau Winter Trophy, L, 3d Macau Cup, L, Macau Spring Trophy, L.
Lodger (Straight Strike). 6 wins from 1200m to 1800m, A$215,250, MRC Yalumba Wines P., 2d Mornington Cup, L, 3d MRC Easter Cup, Gr.3, SCTC Caloundra City Cup, L.
Race Record: 10 Starts 2-0-0 NZ$9,400, A$3,110. 2 wins at 1600m in 2016-17 in NZ.